Giancarlo Stanton and Miguel Andujar homered to help Masahiro Tanaka win his fifth straight decision, and the Yankees beat Baltimore 8-5 on Saturday to extend the Orioles' losing streak to seven games. 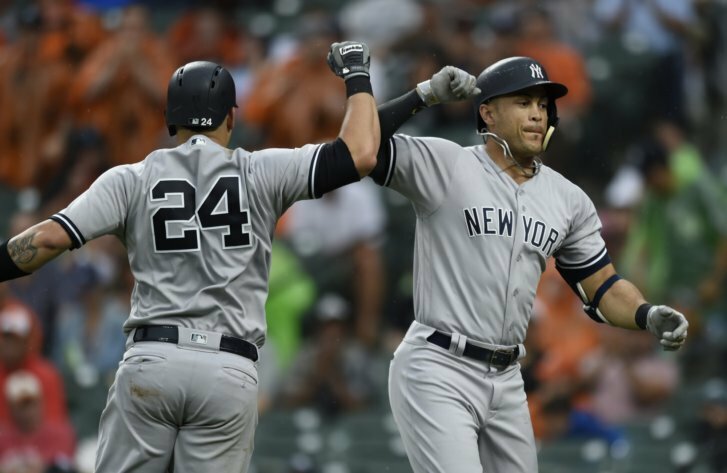 BALTIMORE (AP) — The New York Yankees have been dominant for most of the season, and they certainly don’t need any extra help from the opposition. So, when the Baltimore Orioles had several gaffes in the field, the Yankees took advantage and pulled away from their American League East rival. Giancarlo Stanton and Miguel Andujar homered to help Masahiro Tanaka win his fifth straight decision, and the Yankees beat Baltimore 8-5 on Saturday to extend the Orioles’ losing streak to seven games. The game was delayed 1 hour and 44 minutes because of rain. Tanaka (7-2) allowed four runs and eight hits with seven strikeouts and one walk over 5 1/3 innings. He is 5-0 in seven road games this season — the best stretch of his career. However, Tanaka has allowed 15 home runs in his 12 starts this season. Brett Gardner had a pair of leadoff doubles and scored a run for the Yankees, who have won four consecutive games. The Yankees capitalized on three defensive miscuses by the Orioles in the sixth. Second baseman Jonathan Schoop had a throwing error on an apparent double-play ball by Gary Sanchez off Kevin Gausman (3-5). A sinking liner to center by Didi Gregorius skipped by Jones, allowing Sanchez to score easily from first. Aaron Hicks followed with a single and Gregorius scored on a throwing error by Jones that extended the lead to 6-2. Gausman allowed six runs (five earned) and nine hits with nine strikeouts and no walks over 51/3 innings. “Obviously, that sixth inning was really what beat me,” Gausman said. Machado homered to open the sixth and Tanaka left after allowing another single and walk. Jonathan Holder entered and allowed an RBI double by Danny Valencia that pulled the Orioles to within 6-4. The Yankees pulled away in the eighth on an RBI single by Hicks and a double by Andujar. Jones gave the Orioles a 1-0 lead in the first with a homer to left-center. The Yankees took the lead an inning later on a two-run shot by Andujar. “I’m really excited to be here and be part of the team that is winning,” Andujar said. Yankees 2B Gleyber Torres was selected the AL’s Rookie of the Month for May. He batted .317 with 13 runs scored, 26 hits, a double, nine home runs, 24 RBI and six walks. Yankees: RHP Adam Warren (back strain) threw a bullpen session Friday. “He did well and is likely on track to be called up in the next couple of days,” Boone said. Orioles: Closer Zach Britton (Achilles) will pitch Tuesday and Thursday for Triple-A Norfolk. He will then throw back-to-back outings the following Monday and Tuesday. Yankees: Rookie Domingo German (0-3, 5.45 ERA) is pitching on extended rest because of a rainout Thursday. Orioles: Alex Cobb (1-7, 6.80 ERA) took the loss in his last two outings. He is 6-4 with a 2.99 ERA in 15 career starts against the Yankees.